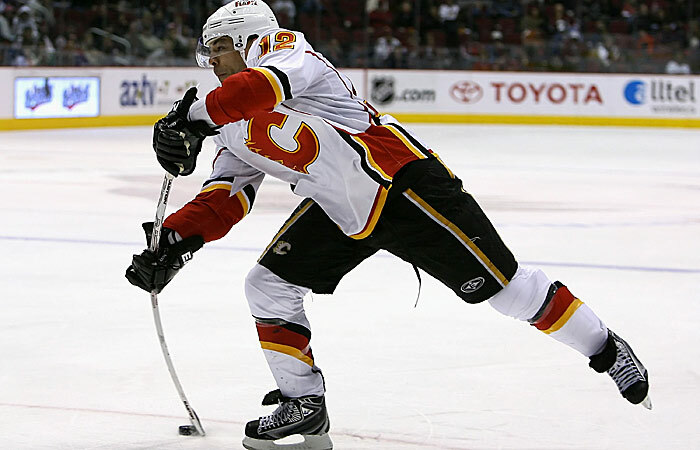 Jarome Iginla looks to help the Calgary Flames regain a share of first place in the Northwest Division. He could get them there while setting their franchise record for goals Tuesday when they host the Columbus Blue Jackets. Iginla, who is third in the NHL with 40 goals, has 364 in 10-plus seasons with the Flames (34-23-9), tying Theo Fleury for the team's all-time lead. Iginla drew even with Fleury on Saturday, scoring twice and assisting on another goal in a 3-1 win at Phoenix. The victory improved Calgary to 5-1-1 in its last seven games and gave it a share of the top spot in the Northwest with Minnesota, which pulled two points clear the next day with a win over Los Angeles and play Chicago on Tuesday. Despite his individual display Saturday, Iginla was more concerned with the team's overall performance. "This was a huge game for us and everyone was ready," Iginla said. "From the opening face off, we started to hit and play sound, defensive hockey. Everyone knows what's at stake now and played well." Iginla has 15 goals and 14 assists in 26 games against the Blue Jackets (30-27-10), with four goals and three assists in the last four games at Calgary. He had a goal and an assist in a 4-3 overtime loss on Dec. 1 before netting a goal in a 3-1 win at Columbus on Dec. 18. Miikka Kiprusoff, who is likely to be back in net after being rested for Curtis Joseph on Saturday, had 36 saves in the Dec. 18 victory, giving him a 9-2-2 record, 1.86 goals-against average and one shutout in 14 games against the Jackets. The goaltender has been even better at home in the all-time series, going 5-0-2 with a 1.55 GAA. Kiprusoff, though, has been shaky of late, getting pulled in his last start after allowing two goals on 11 shots in the first period of a 3-1 loss at Anaheim on Friday. He's lost consecutive games with a 3.61 GAA after yielding two goals during a personal three-game winning streak. The Blue Jackets are four points behind the Vancouver, Colorado and Nashville - all tied for seventh - in the West. They gained a point in the playoff chase Sunday with a 4-3 shootout loss at Edmonton after opening their three-game western Canada road trip with a 3-2 overtime win against the Canucks on Friday. "The disappointing part for us was that we had the lead in the third period and we needed to do a better job," Jackets coach Ken Hitchcock said after Sunday's loss. "We took a penalty in our own zone that was really unnecessary and those are the errors that you make that end up costing you two points." Rick Nash, who leads the team with 35 goals and 56 points, has been hot recently. The All-Star left wing has seven goals and four assists in 10 games after scoring in the first period Sunday. However, he has only four assists in the last 10 meetings with the Flames, and hasn't scored a goal in eight road matchups.